When born, Jacob is given the name "Jacob" meaning, "trickster, supplanter, heel grabber." After he wrestles at Jabbok, he is renamed "Israel" meaning "strives with God." However, after this encounter, the text still calls him Jacob most of the time. Then in Genesis 35, he has another encounter with God and it then begins to call him Israel in the text. But not all the time. Genesis switches back and forth between the names at this point. From Gen 35:21 to the end of Genesis, he is called Jacob about 35 times and Israel about 39 times. One explanation I heard is that he was called Jacob as long as he was living in rebellion. That works for Gen 32 to 35, but not for after because it's then back-and-forth. There are even verses such as Gen 46:2 where he is called by both names in the same verse. What might be the reason for this back and forth? The Name Israel is the God-bestowed (spiritual) name given to Jacob after he prevailed at Bethel, and the name pertains to the continuation of the promises given to Abraham, passed to Isaac and then taken by Jacob when Isaac passed the birthright blessing to him. Here he (Israel) is essentially giving the birthright spiritual blessing to Joseph's sons. (my name be named on them) ie. he is giving away his (God given, spiritual) name of Israel...to Ephraim and Manasseh. Gen 48:20-22 20 And he blessed them that day, saying, In thee shall Israel bless, saying, God make thee as Ephraim and as Manasseh: and he set Ephraim before Manasseh. 21 And Israel said unto Joseph, Behold, I die: but God shall be with you, and bring you again unto the land of your fathers. 22 Moreover I have given to thee one portion above thy brethren, which I took out of the hand of the Amorite with my sword and with my bow. This 'portion above' represents the first part of the "double portion" given to Joseph. Then in Gen 49, we find that it is Jacob, (not Israel) that addresses the other of his sons. He (Jacob) then 'blesses' the others not as Israel, because he had already given that name to Ephraim and Manasseh, Josephs two sons. 22 Joseph is a fruitful bough, even a fruitful bough by a well; whose branches run over the wall: 23 The archers have sorely grieved him, and shot at him, and hated him: 24 But his bow abode in strength, and the arms of his hands were made strong by the hands of the mighty God of Jacob; (from thence is the shepherd, the stone of Israel:) 25 Even by the God of thy father, who shall help thee; and by the Almighty, who shall bless thee with blessings of heaven above, blessings of the deep that lieth under, blessings of the breasts, and of the womb: 26 The blessings of thy father have prevailed above the blessings of my progenitors unto the utmost bound of the everlasting hills: they shall be on the head of Joseph, and on the crown of the head of him that was separate from his brethren. Rabbi Bahya’s physical/spiritual distinction is not at all apparent in the ‘plain meaning’ of the text, and he didn’t explain the Kabbalist sources of his ‘more scientific’ opinion. Still, his mystical reading is reflected in many contemporary interpretations that posit a theological or spiritual rationale for the use of one or the other names (for example). Many such attempts are considerably strained. Another avenue of exploration is suggested by contemporary scholarship. Might the names reflect something of Genesis’s complex literary composition? Might the use of 'Jacob' or 'Israel' reflect different historical sources or intentions? Many scholars note the Jacob cycle of stories is largely centered in the north and trans-Jordan, areas later part of the northern kingdom of Israel. Even among the prophets Jacob figures specifically as the patriarch of the north. Following the general thrust of the documentary hypothesis, the original Jacob stories (oral or written) were composed by a northern storyteller, the ‘Elohist’, and later incorporated into the traditional ‘Yahwist’ stories of the southern kingdom. Over the centuries these stories were amended by a ‘Priestly’ writer and redacted, each writer and editor adding their imprint. For example, in its final form Genesis curiously contains two different stories of Jacob’s name change: Gen.32:24-30 and 35:9-15. 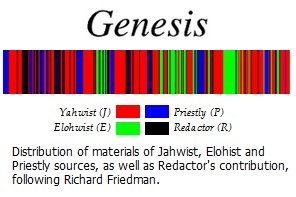 A note in the Jewish Study Bible (JPS) states the scholarly consensus: the second is “the Priestly version of the change of Jacob's name that [the Yahwist writer] reports” in the first. Some still hear within the Yahwist frame the muted voice of the Elohist. One could, therefore, compare the list of Jacob and Israel references against a source outline of Genesis and note how the names are used in each source.2 Does one or another source tend to prefer one name over the other, or use the names differently, perhaps reflecting an authorial purpose other than theology? It’s a 'scientific point of view' worth exploring. 1 This quote appears in various online sources, apparently from Torah Commentary: Midrash Rabbeinu Bachya. 2 Color-coded biblical texts indicating the sources might make this easier, perhaps Paul Haupt’s Hebrew text in the groundbreaking Polychrome Bible (1893), Richard Friedman’s The Bible with Sources Revealed (2003), or the online Wiki text. Not the answer you're looking for? Browse other questions tagged genesis israel onomastics or ask your own question. How often does the Bible use “God of Jacob” versus “God of Israel”? By what Name did God reveal Himself to Abraham?